Welcome to Ranch Enterprises Ltd.
At Ranch Enterprises, we are dedicated to providing you with the most beautiful and affordable Texas land available on the market. Every piece of land we offer is surveyed using the latest GPS technology by a registered Texas Land Surveyor. All plats of the property offered for sale are approved by the County Commissioners Court of the county in which the property is located and the plats as well as all easements to the property are recorded in the Plat Records of the county. Our sales team of ranch specialists will be by your side through the entire land buying process. 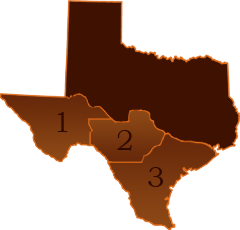 Land is one of the most valuable purchases you will ever make in your life and we strive to provide you with as much information as possible so you can make a confident decision when the time comes to buy your piece of Texas. As a state leader in recreational, retirement and hunting land sales, we offer competitive financing options. Ranch Enterprises offers fixed rate owner financing for up to thirty (30) years on all property offered for sale with as little as five percent (5%) down. Ranch Enterprises is the largest seller by volume of land sales funded by the Texas Veteran Land Board, if you are a qualified Texas veteran, our sales team can walk you through the loan process of the Texas Veterans Land Board.